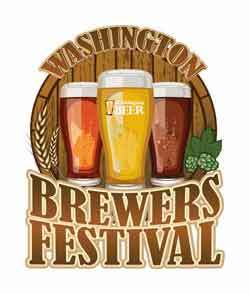 The Washington Brewers Festival is just 10 days away. The festival represents the single largest gathering of Washington breweries and beers. This year, the festival offers more than 330 beers from 88 different breweries. This sets me to thinking about the nature of Washington beer and the 200-plus businesses that brew it. Below I list Washington’s top 22 breweries. As of this moment, the Washington State Liquor Control Board reports that 259 breweries call Washington home. Subtract about 25 from that total and you arrive at a more realistic number. I will not bore you with the details of my reckoning and I do not assert that my calculations are absolute. It’s a nebulous number, a moving target. Click image to see the list. Let’s call it 235-ish, but note that when anyone else talks about the number of breweries in Washington they refer to the official number provided by the Washington Liquor Control Board (259). California stands alone as the only state with more breweries. The Brewers Association (the organization representing America’s craft brewing industry) recently released its list of the 50 largest craft breweries in America (production volume). None of Washington’s 235-ish breweries made the list. Does it seem odd that Washington supports more breweries than any state but California, but none of our breweries rank among the nation’s top 50? Below I list the 22 breweries in Washington that produced in excess of 3,000 barrels in 2013. Obviously, I do not intend for this to be a list of the “best” breweries. This is all about production volume. Yep. Out of our 235-ish breweries, just 22 produced more than 3,000 barrels last year. What does this mean? Obviously, Washingtonians fancy small breweries. And what does that say about us? I have no idea or opinion. I’d love to hear yours. One thing is for sure, if you want to drink Washington beer, you need to visit Washington to do it. Very few of our breweries produce enough beer to ship it out of state. No wonder Washington beer fails to capture the attention and admiration of the national audience. The rest of the country simple does not know about our beer. Note that some of the breweries listed above (Elysian, Diamond Knot, Ram) produce beer at multiple locations. The number reflects the total from all locations. * I rounded off the number of barrels to the nearest hundred. This information appears courtesy of the Puget Sound Business Journal, which compiled the numbers using data from the Washington State Liquor Control Board and brewery websites. The PSBJ published this information in the May 30, 2014 issue. While they did their best to provide realistic numbers, PSBJ does not guarantee absolute accuracy. 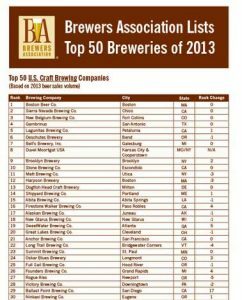 ** Although Redhook Brewery produced enough beer to make it into the top 50, the Brewers Association does not consider it a craft brewery. By the BA’s definition, Redhook is not independent and therefore is not a craft brewery. How many of those 259 bottle or can? I’d suspect a lot of the beer made in WA is consumed on premises, or taken away in growlers or kegs. Yep. It’s true. Many or most WA breweries don’t package in bottles or cans. Got to love the variety offered in WA. I think quality can be lost with volume. It’s all about quality, not quantity. Washington has the best beer of any state. When you start to mass produce an item, you lose that special quality. It certainly looks like Washington is interested in drinking local beer, and that with the number of breweries, we don’t have to go very far to get it. Also, if few WA breweries package in cans or bottles, that local bars and restaurants prefer local kegs to other offerings from the top 50. Personally I wouldn’t say its quality over quantity as the top 50 are all very quality brews. But I’d also say that all of WA’s top 22 listed are also quality. I wonder what the mix of in-state vs out-of-state beer sales are around the country? Ryan, addressing a couple of your points. WA consumes 1 million barrels of craft beer each year. WA Brewers produce about 1/3 that much beer. So, 2/3 of the craft beer comes from out of state. Explains why so many breweries from across the country clamor to sell beer here. We’ll drink it. Again, those numbers are a couple years old. I don’t know, but it seems to me that you probably need to be producing X amount of beer before bottling/canning pencils out with the accountants. Many of our local brewers have yet to reach X. Over the last two decades or so Washington has had one of the most craft beer friendly regulatory environments in the country, thanks to the pioneering work of some of our oldest craft breweries (Redhook, Hales, Pyramid/Hart, etc.) and the work of the WA Brewers Guild. What this means is that most of us have busy taprooms where we can serve our own beer without necessarily having to be a full brewpub. This also means you can make a go of it on a smaller system. This has not always been the case in other states. So when you can usually sell plenty in-house to keep the lights on and the beer flowing, the wholesale market takes on secondary importance. The Taproom always comes first. Given the logistical challenges of increased wholesale distribution, and the comparatively low payoff, its no wonder we have many smaller breweries in which wholesale is only a portion of their volume, and much of that is in kegs. Now that we have several mobile bottling companies around, there’s be a profusion of new bottles on the market. But they still present logistical challenges. Space is a big one. Many breweries don’t have room to store them cold, for example. And tight schedules can create inconsistencies. But we’ll be seeing a lot more in bottles over coming years. There’s no regulatory requirements to work with wholesalers either. We can self-distribute in this state, so there’s no reason to deal with a distributor unless you want to. Most of us choose to just toss kegs in the back of the van and deliver them ourselves at higher profit. But you can only deliver so much volume yourself before taking on more staff, vehicles, kegs, etc. which might not pencil out. Which is why the majority of breweries are producing volumes below that list. To my knowledge, Hales is the only one of those 22 that still self-distributes. In short: there’s a stable range of production in there below that list that it’s tempting to rest at. I think of it as the pond a salmon rests in before the next waterfall. Because the next jump is expensive, and if you don’t do it right you can actually make less money selling more beer. Great points Russell. You’re a guy who’d know. I’m curious about the statement that Redhook is not independent. Redhook is part of a publicly traded company, Craft Brew Alliance, “which is not itself a craft brewery.” Therefore they do not qualify as independent.